HTC after launching its Facebook Phone HTC Salsa last month launched HTC ChaCha. HTC salsa is full touch screen phone whereas HTC ChaCha is a 4 row QWERTY phone with touchscreen. The Android based smartphone is priced just Rs 15,990 and would give good competition in the mid-range smartphone segment. Chacha is a touch+type phone. It has a small 2.6 inches screen, thought the 4 row full size QWERTY keypad makes up for it. It has a 800 MHz processor, 512 MB RAM, a 5 MP rear facing camera whereas a VGA front facing camera. Other features such as Wi-Fi, Bluetooth v3.0, GPS, 3G are on board. ChaCha runs on Android 2.3 Gingerbread OS. ChaCha being a Facebook phone has a dedicated Facebook button which helps you to share your photos and videos instantly. You can even update your status using this button. Your home screen shows all the updates on your Facebook account. HTC has partnered with Tata Docomo in India. 3GB data with validity of 90 days. 300 local On-Net mins free for 3 months. 3GB data valid for 90 days. 3 hrs Mobile TV valid for 90 days. 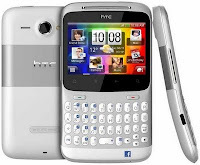 Overall HTC ChaCha has a nice design, good features and specifications. ChaCha will find competition with the Nokia E6 and Samsung Galaxy Pro. Nokia E6 has a 2.4 inches screen where as the Samsung Galaxy Pro has a 2.8 inches screen. But HTC ChaCha can find an edge over it rivals because of the dedicated Facebook button.